Boardwalks carve their way deep into the Big Tree Reserve, Styx Valley. Deep in the heart of Tasmania’s lush Styx Valley, Koren Helbig discovers a centuries-old forest housing the world’s tallest hardwoods with a little help from a flea market map. Without the mud map, we’d have easily missed it. Leafy overgrowth has all but obscured the entrance to the Tolkien Track, along which grows an enormous 84-metre tall tree named Gandalf’s Staff. Back in 2003 this hulking swamp gum made international headlines when protestors set up a Global Rescue Station high among its branches, camping up there for five months and setting a world record for the highest tree-sit in a courageous act that ultimately saved the tree from chainsaws. But Gandalf’s Staff is harder to find these days. The tree is shrouded within a sheltered forest walking track that meanders past several other astonishing examples of nature’s ancient majesty, including a 75-metre twin-trunked gum known as Fangorn and the aptly named Cave Tree, its cavernous trunk big enough for half a dozen people to sit inside. Scientifically, these trees are known as Eucalyptus regnans, and regnant they are, ruling over the rainforest at their feet. They are the tallest trees in the Southern Hemisphere and worldwide are topped only by California’s redwoods. My sister and I have driven into the heart of Tasmania’s Styx Valley in a slightly battered campervan, following a Wilderness Society self-drive and walking track guide we’d chanced across the weekend before in a stall at Hobart’s colourful Salamanca Market. It was a lucky find. Signs are few and far between out here so the Wilderness Society’s rudimentary map really is the only way to find sites nestled off the main road. As we delve deeper into the valley, the only other sightseer we meet clutches a copy of the same pamphlet. Reaching for the sky, Huon Pine Walk, Styx Valley, Tasmania. For what little more than a decade ago was the epicentre of one of Australia’s great battles between conservationists and loggers, this astonishing place – adjoining the vast Tasmanian Wilderness World Heritage Area, about 90 kilometres from Hobart – is afforded surprisingly little fanfare. That’s not to say the Styx is completely unknown. 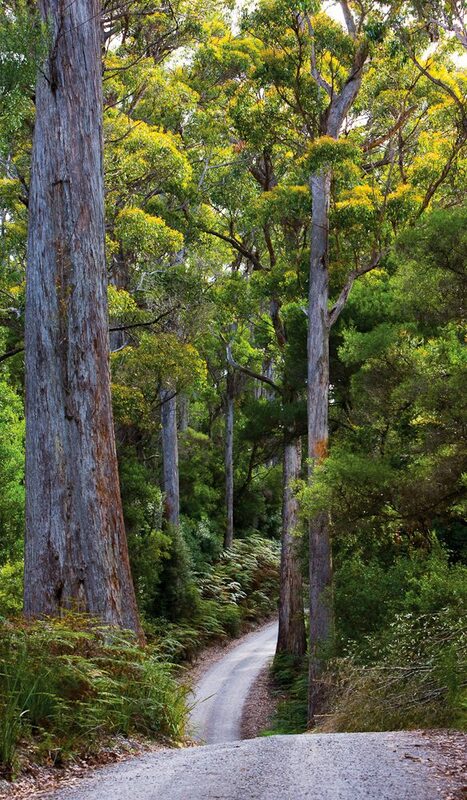 Its biggest drawcard is the Big Tree Reserve, a stand containing some of Australia’s tallest living trees. Yet despite that impressive claim to fame, the valley is overshadowed by its more well-known neighbour 30 minutes north-east, Tasmania’s oldest national park, Mount Field. Only a small proportion of those who plod along Mount Field’s kid-friendly walking trails to secluded waterfalls, or pitch a tent in the park’s riverside campground, make the drive down to the Big Tree Reserve. Even fewer realise there’s far more to see just a few hundred metres further along the road. So on this nippy early autumn afternoon we set off down Gordon River Road from Mount Field, passing through the tiny blink-and-you’ll-miss it country town of Maydena. We then loop off onto the serpentine dirt Styx Road that constitutes the valley’s main thoroughfare. Our Wilderness Society pamphlet urges caution as we’ve now entered an active logging area, though the warning is hardly necessary. Plantation trees grown for wood chips stand sentinel in uniform rows beside swathes of land wiped bare but for sad little piles of broken branches bulldozed into stacks ready for burning. Echinda. No we’re serious, Styx Valley, Tasmania. We are, I realise, crossing a battleground of sorts. Since Europeans colonised Tasmania in 1803, huge tracts of old-growth forest have been felled across the island to feed sawmills and, more recently, wood chip mills. For much of the 20th century, the 400-year-old swamp gums that blanketed these hillsides were valued only as profitable grist for the mill. 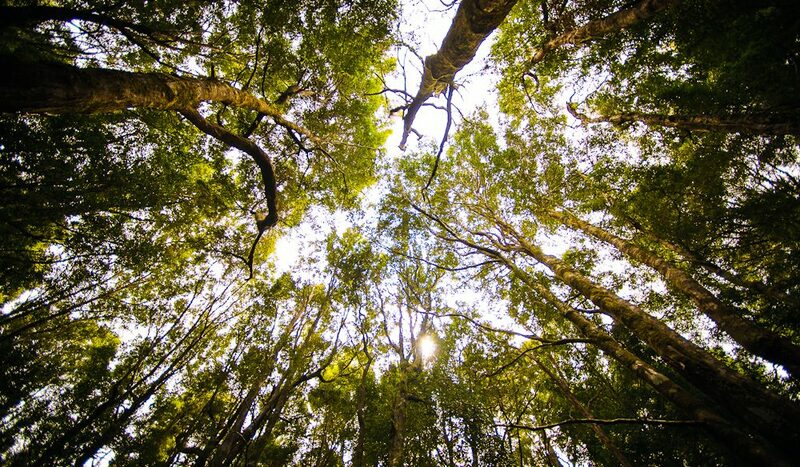 It was only in the 1990s that campaigns against the destruction of the world’s last great unprotected stands of Ecalyptus regnans, the tallest hardwoods and tallest flowering plants on Earth, really began to gain momentum. 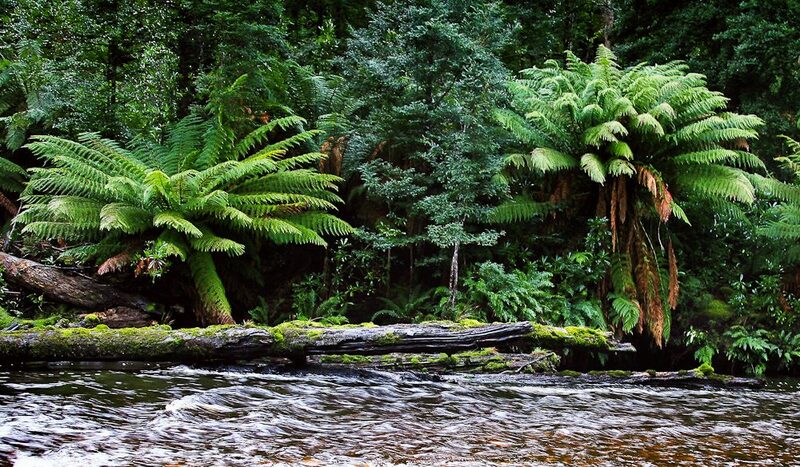 Since then, conservationists have fought for a ‘Valley of the Giants’ national park to protect the Styx, clashing with loggers whose work remains an important driver of Tasmania’s economy. The island-wide debate over Tasmania’s future is writ large here right before our eyes. About 10 kilometres in we come to a bridge beneath which the Styx and South Styx rivers meet, their waters steeped a golden tea-brown by fields of native button grass upstream. According to Greek mythology, the River Styx is the boundary dividing the land of the dead from the land of the living. Soon after we cross, the sober graveyard of clear-cuts gives way to lush tracts of sassafras and myrtle, through which the mammoth trunks of centuries-old swamp gums explode skyward like Jack’s beanstalk. Our mood lightens as the forest thickens. We reach the Big Tree Reserve, really the only Styx Valley attraction so far set up for tourists. To the right, a raised boardwalk meanders into the protected forest, its wooden planks overlaid with chicken wire to guard against slipperiness in the near-constant damp. Officials call this forest ‘over-mature’ meaning that, left undisturbed, it will probably transform into rainforest within the next century. Many of the enormous swamp gums here, nearing the end of their grand 450-year lifespan, are declining in height by an average of three metres per decade, slowly giving way to the lush understory and mossy ferns beneath. Unless the rage of a bushfire spurs new seedlings into generation, these giants will slowly crumble without replacement; a natural changing of the guard. The reserve’s most impressive swamp gums are named like rival siblings: the 86-metre ‘Big Tree’, christened years ago when it was thought to be the tallest here, has since been overshadowed by the 87-metre ‘Bigger Tree’ nearby. The latter was discovered quite by accident, when arborists climbed Big Tree and noticed its taller sibling soaring even higher, 100 metres to the south. The lifeblood of the forest, the Styx River runs a tea-brown colour thanks to the fields of button grass upstream. Our necks ache as we crane our heads back to glimpse their crowns, flung some 30 storeys heavenward like a living skyscraper. A wooden viewing platform before Big Tree tilts 45 degrees backward to better angle our line of sight. In a silence broken only by birdcall and the gentle rustle of leaves in the wind, we marvel at this giant, which would have been just a sapling 400 years ago when America legalised slavery, an adolescent when the Spanish Inquisition forced Galileo to recant his belief that the Earth revolves around the Sun and growing tall and strong long before any Europeans set foot here. We stretch our arms across Big Tree’s wall-like trunk; to encircle its base fully we’d need to join hands with another four or five people. Back out on Styx Road, we cross to the left-hand-side forest and follow a wide walking trail down to the tannin-stained river. 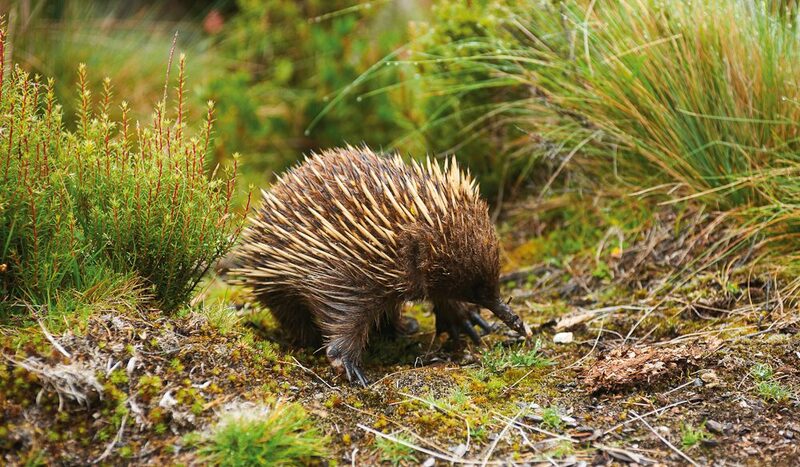 A rustling in the bushes catches our attention and an echidna moseys out of a fallen tree hollow, poking about in the brush for a few moments before ambling away. According to our Wilderness Society map, you may also spot platypus and native water rats, pygmy possums, owls, bats and black cockatoos, the latter nesting within the large hollows that develop in the crooks of swamp gum branches. We jump back in the campervan, turning right onto Waterfall Creek Road and pulling up some 800 metres further along to try and find the Tolkein Track, using our map. But we walk up and back before locating its entrance, which is announced only by a sliver of pink plastic looped over a tree branch. Like Hansel and Gretel chasing breadcrumbs, we follow more scraps of pink plastic through the shrubbery and uphill, our sneakers squelching in the mud. Tiny metal signs announce the names of notable giants as we pass, each a continuation of the Lord Of The Rings theme: Fangorn, the Cave Tree, Morannon and, finally, the famed Gandalf’s Staff. After the Greenpeace and Wilderness Society tree-sit here in 2003, the Big Tree Reserve was expanded in 2005 to include the Tolkien Track, protecting this small section from logging. All that’s here now lies peaceful and mercifully untouched, as it has for centuries. Other areas of the valley haven’t been so lucky. The shadows are growing longer now and we’re worried about kangaroos that stray onto the road at dusk. We press on to The Chapel Tree, five kilometres away up another rocky forestry road. This walking track is even more overgrown and we turn sideways to push through shoulder-height fern fronds leading down to an enormous naturally hollowed-out swamp gum, big enough to walk into. People of all religions have apparently married here. Telltale slivers of pink plastic mark a 30-minute walking track to the nearby Christmas Tree, but we’re out of time. The map also tells us that further up the Styx Road lies Shinglebend, a spectacular spot for a riverside picnic. their way deep into the Big Tree Reserve, Styx Valley. 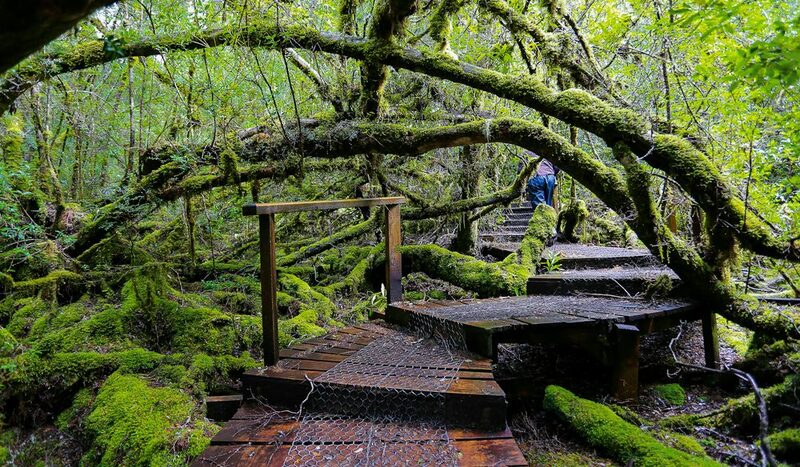 From there, it’s only a short drive back to Gordon River Road, completing the Styx Valley loop – but there’s no reliable exit that way as the road turns briefly private and gates are often locked. So we retrace our route instead, back through the old-growth forests, over the Styx River bridge and past the plantation rows beside clear-felled hillsides. The scars of logging seem even more objectionable, having emerged from the peaceful shelter of ancient forest. Yet perhaps the logging roads that cut deep into these forests will eventually prove to be their saviour. For it’s by these roads that we now gain access to areas that would otherwise have remained impenetrable and easily forgotten. Once we’ve stood before these colossal gums, perhaps we’ll feel more compelled to save them. Get there: Qantas fly from all capital cities to Hobart, with return flights from $230. Stay there: Hobart has a range of accommodation from which to explore Tasmania’s wilderness. The excellent Henry Jones Art Hotel has rooms from $220 a night. I think if you check the official figures, forestry is hardly an “an important driver of Tasmania’s economy”. It sits far behind tourism and other industries and has in fact been the beneficiary of substantial and ongoing subsidies from the taxpayers. Thanks for the article – it certainly is a splendiferous valley. I am at the Wilderness Society stall every Saturday. So glad our map helped. Over September and October we have re-tagged the tracks and put up more signage. We have just this week printed a new more detailed version of the map and developed a Learning Guide for all the walks. Launching everything in the Styx this Sunday at a family friendly event – see today’s newspaper article. That’s a great reason to go back again, and again… Glad you enjoyed. Let us know how you go next time! What a wonderfully well written article. I happen to chance this after our visit yesterday to the Styx valley. We were fortunate enough to have walked the Tolkien track and it is exactly as you have said. Majestic and very special. We found out about this through our hosts at our accommodation. 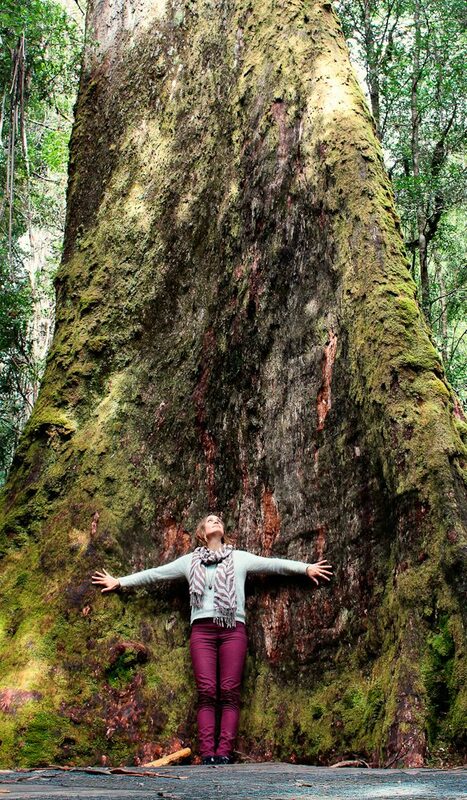 I’ve always been fascinated by our old growth forests more specifically the giant mountain ashes (swamp gums). Having spent a lot of time in the otways in Victoria I was thrilled to see some very special specimens on the Tolkien walk. Yes the walk is difficult to find though I believe now there is a small sign next to the ribbon stating the entrance to the walk. The path is a little overgrown but that just adds to aura of the place. The path is clearly marked with ribbons so it’s easy to follow. I strongly recommend this walk. I’m also thrilled that it’s protected. Hopefully on time more of this wonderful wilderness falls under protection. It’s certainly one of the most amazing wilderness areas in the world. Glad you enjoyed it so much.